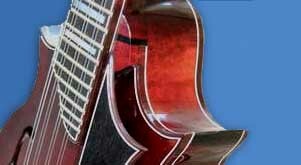 Many folk/bluegrass musicians have come from the world of the Pentatonic Scale. We've warned about the limitations in basing all your improvisation on static vanilla Pentatonic riffs, and have tried to introduce you to alternative approaches to improvisation, through a variety of scales and modes, and of course the FFcP patterns to get you to think in chords, too. Still there is opportunity in the Pentatonic, as many Bebop era jazz musicians have developed in their soloing (see Jazzed Pentatonics). Meanwhile we want to point out an exercise we introduced several years ago that can help get you down the path of fretboard mastery, and there's an opportunity for you to dig deeper. 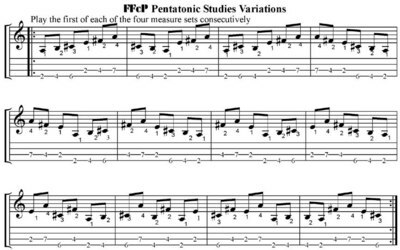 Check out a popular download in our FFcP library, Pentatonic FFcP. Note, this is new material, not in the GiJM book.